Which came first, the asparagus or the flounder? The question has been debated through the ages on the East End. 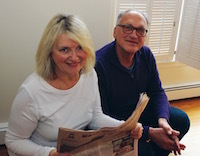 North Forkers know it’s spring when Wickham’s rolls up its doors, letting a flood of light onto tables displaying not much more than fresh-cut spears, boxes of donuts, and a few stalks of rhubarb. On the other hand, flounder season opens around the same time, and the asparagus do emerge later on the South Fork. Or did the egg come first after all—on both sides of the Bay? Richer, creamier, and even more golden right now, spring eggs benefit from hens getting out of the house for a turn around the yard in the cool air and sunshine. 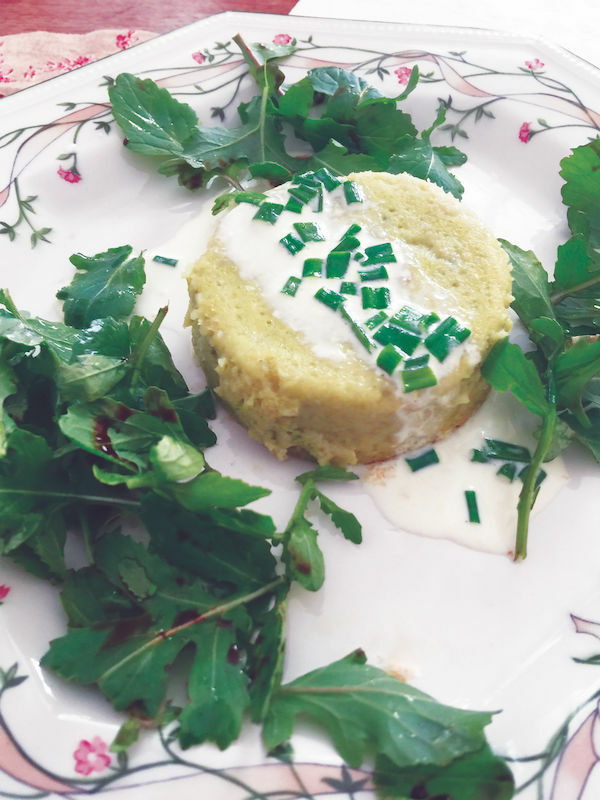 For our two-dish menu this month, asparagus definitely comes first, in a savory custard called sformato that kicks off many a spring meal in Italy. It’s full of eggs. As a second course, we give you flounder. For the time being, hold the chicken. You say sfor-MATE-o and I say sfor-MAH-to—but what exactly does the word mean? Leonardo da Vinci, first credited with using the sformato painting technique in works like the Mona Lisa—would like you to know that the term derives from fumo (smoke) and connotes a soft shading between colors and tones. 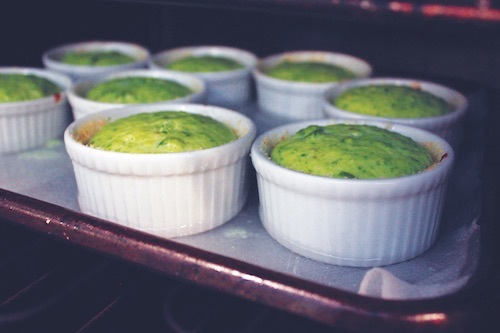 These little tarts can be made with other vegetables, but they reach artistic perfection with our fresh local asparagus. Trim the tough, woody ends off the asparagus stalks. Bring a large pan of lightly salted water to a boil before adding stalks. Let water return to a boil and simmer asparagus for 1 minute until tender but still firm. Cool asparagus in a colander under cold water to stop cooking before draining on paper towels. Gently heat olive oil and 1 tablespoon of the butter in a skillet. Add sliced leeks and cook over very low heat until tender, being careful not to let them brown. If they start to color and stick, add a couple of tablespoons of water. Remove from heat and set aside. Slice the tips from the asparagus spears and set aside. Cut the remaining stalks into two-inch pieces and put them in a food processor along with the leeks. Puree until smooth and set aside. Heat the milk in a small sauce pan (do not boil). Melt the remaining 1½ tablespoons of butter in a larger sauce pan and stir in the flour. Cook over gentle heat for a couple of minutes until pale golden brown. Add the milk and bring to a simmer, stirring continuously over low heat until thick. Add nutmeg and cheeses. Salt and pepper to taste. 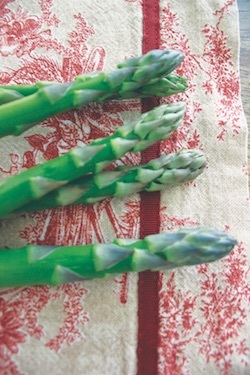 Fold in about 2 cups of the cooked asparagus- and-leek puree (you may have some left over) before adding eggs. Whisk until mixture is smooth and well-blended. Heat oven to 350 degrees. Line the bottom of a heavy roasting pan with a dishtowel. Grease ramekins with softened butter, dust with the breadcrumbs, and fill them with puree, up to about half an inch from the top.. Bring a kettle of water to a boil. Place custards in the pan, adding boiling water halfway up the sides of the ramekins. Place the pan in the middle shelf of the oven and bake for about 30 minutes until set. Remove ramekins from pan and set aside. Place chives and cream in a small pan and warm over low heat. Do not let cream boil. Season with a little salt and set aside. Whisk the olive oil, mustard, and lemon juice in a small bowl and dress the arugula. Add a pinch of salt and a grind or two of pepper. Firmly tap the base of each ramekin on the counter before running a knife around the inside to loosen. Gently turn out each custard onto the middle of a small plate. Arrange a handful of dressed arugula around the rim of the plate. Spoon a tablespoon of warm chive cream over each sformato and serve. Handle with care. Flounder is delicate, but this easy recipe requires no magic tricks. Seven minutes in a hot oven is enough to transform it into a company-worthy dish. The secret’s in the crust—a thin coating of mayonnaise, Dijon mustard, and diced shallots covered with Parmesan and breadcrumbs. P.S. You must make your own breadcrumbs, as store-bought will simply not pass muster. Gently heat oil and butter in a heavy skillet. 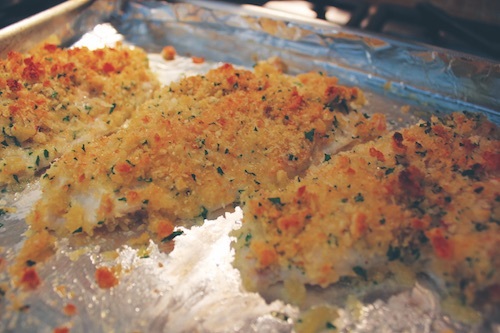 Add breadcrumbs and cook on low heat while stirring constantly until crumbs turn light golden brown. Remove to a bowl. When cool, stir in the Parmesan and chopped parsley. Add salt to taste and a couple of grinds of pepper. In a small bowl, mix together the mayonnaise, Dijon mustard, and shallots. Heat the oven to 440 degrees. Line the baking sheet with aluminum foil and spread with the softened butter. Pat the flounder fillets dry with paper towels and place on the baking sheet. Spread a thin layer of the mayonnaise mixture over the top of the fish. Cover with a layer of breadcrumbs and gently pat into the mayonnaise . When all fillets are coated, place baking sheet in the middle shelf of oven and bake for 7 minutes. Serve with lemon wedges and maybe a sautéed spring green such as spinach. Sourdough boule or an Italian loaf are best, ideally a day or two old but not stale. Tear the bread into small pieces, spread on a heavy baking sheet, and toast in a 350-degree oven for 10-15 minutes. Do not let crumbs start to brown. Cool the bread and place in the food processor and pulse to medium coarse (not fine) crumbs. Store excess crumbs in an airtight container for up to two weeks in the refrigerator or freeze them.